There are a lot of mistakes in online car listings, typically “manual” vehicles that end up having a “PRNDL” by the shifter. But it gets far worse than that, like the fact that the most expensive car listed on Autotrader right now is a nearly $9 million Mazda 3. Yes, it’s a typo, but it’s a glorious typo. Maybe you would pay $9 million for a budget front-wheel-drive car that starts at less than $20,000. Good for you. You know what you want. But most people would probably rather have the Ferrari F50, LaFerrari or the Bugatti Chiron all listed under it for half of that price. Welcome to the hilarious realm of pricing typos, where the Toyota Sienna minivans and Chevrolet Equinox crossovers of the world get to share the same retail space as the highly collectable supercars. The amazing thing is that this isn’t limited to a few dealers. Just like tons of the “manual” cars listed online end up being automatic, a good portion of the most expensive listings on Autotrader are there by mistake. On the first page of all listings sorted from most to least expensive, 10 of the 25 price listings are typos. You want a Mazda 3 with not too many miles, maybe 40,000, you say? Have at it. It’ll only cost quadruple the amount of money you’ll earn in your lifetime. What about a new Toyota Sienna LE? Minivans are getting better by the year, but apparently they’ve gotten good enough to be in the $3.3 million bracket. Your kids will be sure to go to school and tell their friends how cool their parent was, for making the responsible decision and going for a people hauler over the slightly higher priced LaFerrari. That thing is too low to the ground anyway. We can’t forget about the Toyota 86 for a cool $3.1 million, its package coming complete with all of the beautiful handling you could ever ask for—and none of the power, of course. Did you think a few extra million was enough for a turbo? The problem with the Sienna and 86 listings seems to be just an extra number added onto the end of their prices, since the Sienna has a $34,000 MSRP and a $3.3 million listing while the 86 has a $32,000 MSRP and a $3.1 million listing. 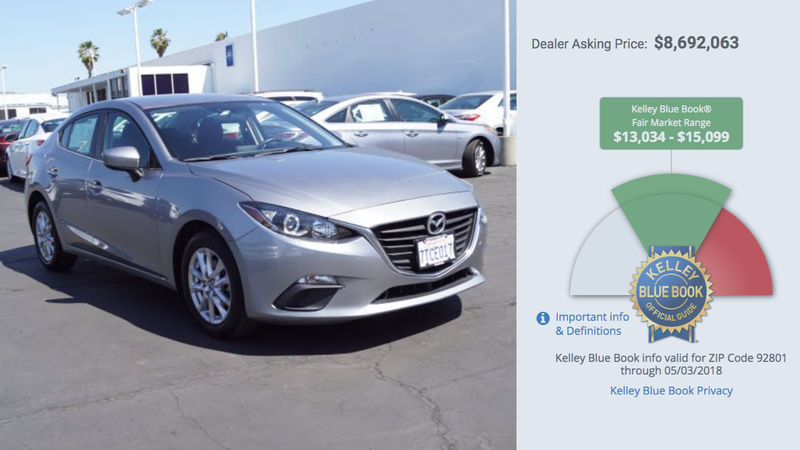 But the whole thing is kind of incredible—that dealers don’t maybe, just maybe, consider double checking online listings to make sure they’re right, since their whole job is to sell vehicles with proper ad descriptions and prices that are at least fathomable.